Bob Holmes, CLU, ChFC, RHU, CLTC | Consolidated Planning, Inc.
Bob entered the financial services industry in 1971 after returning from Vietnam where he serviced as an Artillery Officer. He later served as a Battery Commander for an Artillery unit in the Ohio National Guard. Bob obtained a Bachelor of Business Administration (BBA) degree from Ohio University and has continued his professional development by earning the advanced Chartered Life Underwriter® ( CLU ®), Chartered Financial Consultant® ( ChFC ®), Registered Health Underwriter® ( RHU ®), and Certified in Long Term Care® ( CLTC ®) designations. Bob is a member of the Charlotte chapters of the National Association of Insurance and Financial Advisors (NAIFA), and the Society of Financial Services Professional (SFSP). 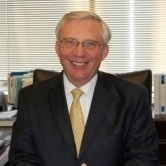 He has conducted Successful Money Management seminars at Queens University, as well as other financial education seminars to include Aiming for Ideal Retirement, Long Term Care, and Financial Strategies for Successful Retirement. Bob is a 30 year resident of Charlotte, N.C., and resides with his wife Claire. He is a father of 3, step-father of 2, and grandfather of 6. When not spending time with his family, he enjoys playing golf, community outreach, and is a Eucharistic Minister at St. Matthew Catholic Church.